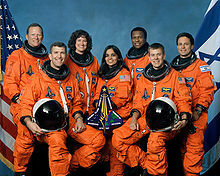 We remember with gratitude the seven souls who were lost aboard the Space Shuttle Columbia. In pursuit of knowledge and the exploration of our universe, these brave individuals faced exceptional dangers and ultimately sacrificed their lives in the name of science and exploration. We must continue the noble work of the Columbia and her crew and remain a nation that is steadfastly committed to the exploration of that enormous expanse of unvisited territory—the next frontier.